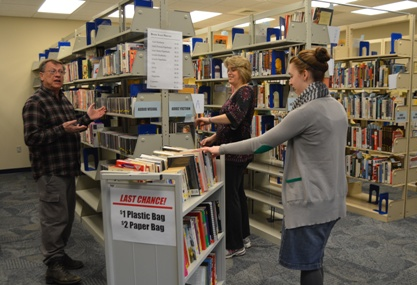 The Book Sale Room is located at the Merrillville branch and contains not only books, but movies and music as well! You never know what you might find if you look through our shelves. 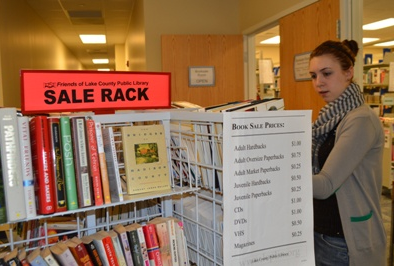 If it is outside of Book Sale Room hours, or if you can't make it out to the Merrillville branch, look for Book Sale racks at all branches! Work with acrylics & canvas on an easel, following instructor's example to create an original piece of art. $20 cash fee paid at the time of class covers all materials. Baby & Me Time is a 1/2 hour program which includes songs, stories, and sensory play for babies 0 to 23 months and their caregiver. Children will have the opportunity to read to one of the dogs (accompanied by their trainers). The dogs are provided through Power Paws for Kids, a non-profit organization. All ages welcome. Join us for this craft criss-crossed with a writing class, where we'll take used books to make blackout poetry. Ages 12-18. Please register.